As you can see, the Capture Dashboard includes some extremely useful information. That said, however, the Capture Dashboard only displays a handful of schema properties (the attribute name, the attribute datatype, and any data constraints associated with the attribute). And that’s it. You cannot look at the Schema page in the Capture Dashboard and determine whether or not attribute values are case-sensitive, or whether you can use a specific attribute in a Console search. If you want that kind of information (and you probably do), you need to turn to the Console’s Manage Schemas page. Note. 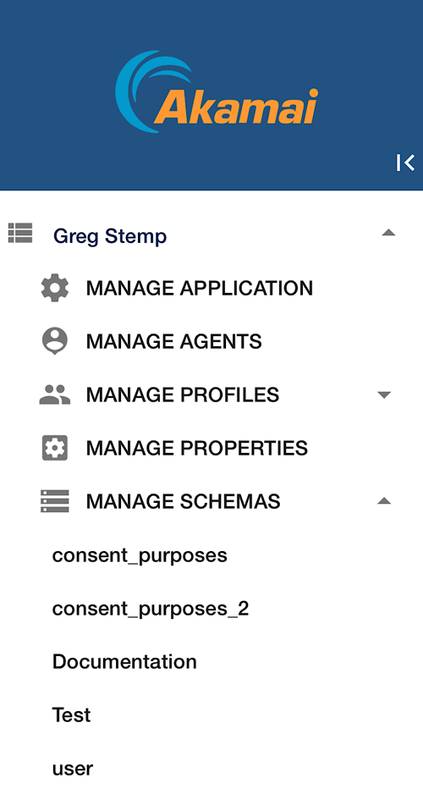 At this point in time, the Manage Schemas page is read-only: you can view schema information (and download a copy of the schema), but you can’t really manage the schema: you can’t add or delete attributes, mark an attribute as searchable or case-sensitive, etc. In the future, that will likely change. For now, however, managing your schemas means using the entity type APIs or contacting your Akamai representative. That’s all there is to it, although there are couple of things to keep in mind here. First, the Manage Schemas link is only visible if you hold a Console role that gives you access to schema information: if you don't have such a role you won’t even see the link, let alone be able to access the page. In addition, clicking Manage Schemas only toggles the display of the individual entity types used in your organization. 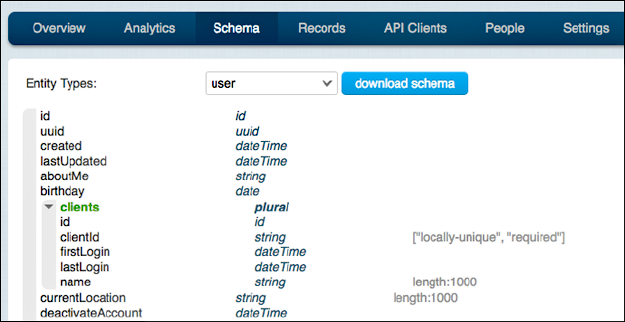 To navigate to a schema page, click the name of the entity type itself (e.g., user).